Ladies and gentlemen, for your edification today I present to you a most revolutionary, equalizing and liberating object. It changed the social order in America and across the world, and according to some, was first used regularly right here in our fair city. I give you: the barstool. But before we get to the whys and wherefores of this simple, three- or four-legged tool, let’s talk first about saloons. Dark, dirty, nasty and horrifically smelly, the lowest level of saloon in Detroit and elsewhere would be nearly unrecognizable to us today. Take the scummiest dive bar you know (and hopefully you have the honor of knowing several of them) and add spittoons conveniently placed but rarely used, and certainly never cleaned. The windows are dark and shuttered since no one really wants to see what goes on. Since the outhouse is too far away, there are simply trenches dug in the dirt floor or a trough at knee level attached to the bar, leading to a hole in the floor. That floor, by the way, was made of dirt covered with layers upon layers of sawdust to absorb all of that effluvia. for years the volcanic center of a strange tenderloin, a landmark and a black mark of downtown Detroit…The red lights of this quarter were targets for next-door gun-men. Footpads prowled at every turning. Here was one place slumming parties avoided, and save for unavailing sorties by police and squadrons, the assorted patrons of the Bucket of Blood lived their fiery existences undisturbed. 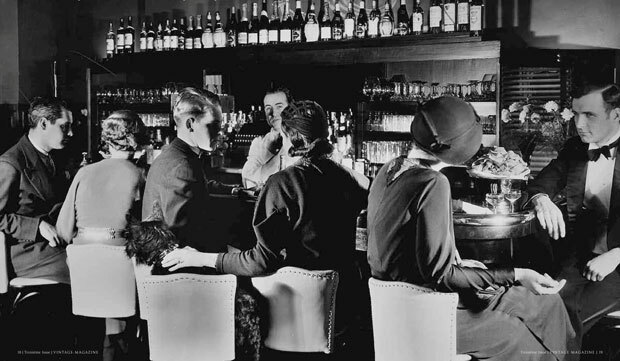 The plain and simple truth of it is, women didn’t drink at Detroit bars before Prohibition. Or perhaps I should say, ladies didn’t drink in saloons. 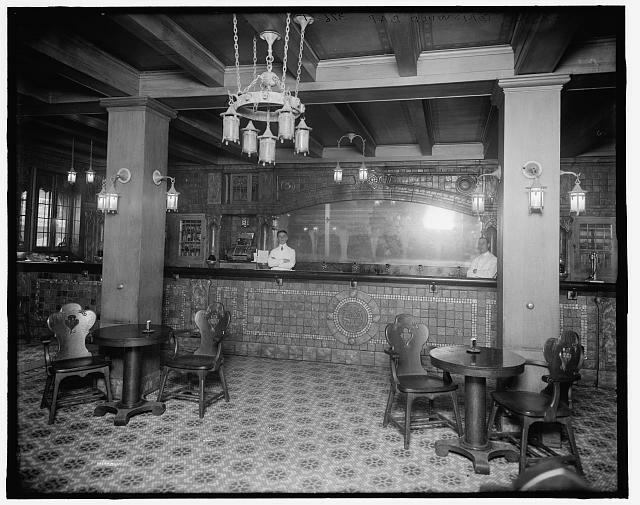 There were prostitutes a’plenty, but aside from the relatively new fine dining restaurants, hotel cafes, and roadside taverns, the bar, from the foul Bucket of Blood to the refined Detroit Athletic Club, was the exclusive domain of men. Few people, it seems, recognize or remember the history of some innovation years after it appeared. 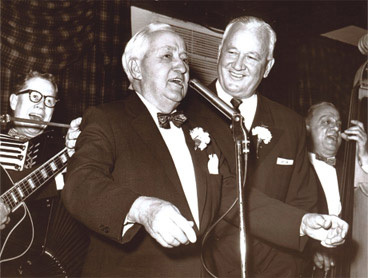 So it is that hardly anybody remembers that it was Cliff Bell who introduced bar stools to the tavern or vice-versa. 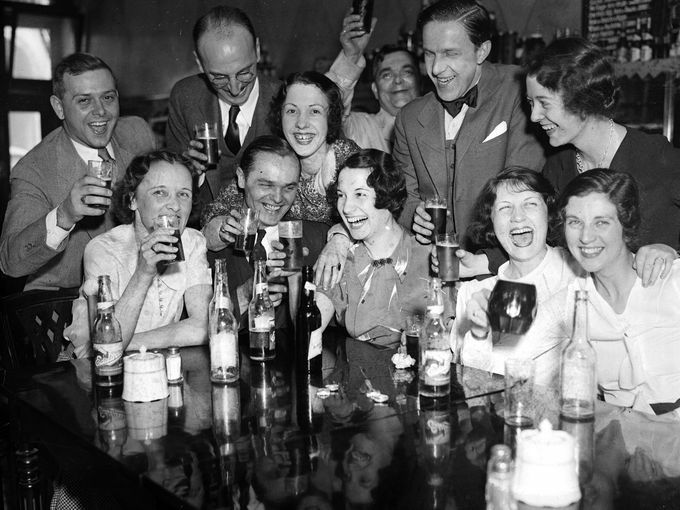 The Erskine Bridge Club, as near as anyone has been able to determine, was the first saloon to have stools at the bar. Before you go posting photos of people sitting on barstools from days of yore, yes, I’m pretty sure that someone had thought of adding a stool to the bar before our boy Cliff came along. In fact, men and women in Europe and other more advanced civilizations were happily perching all throughout our dry years in America. 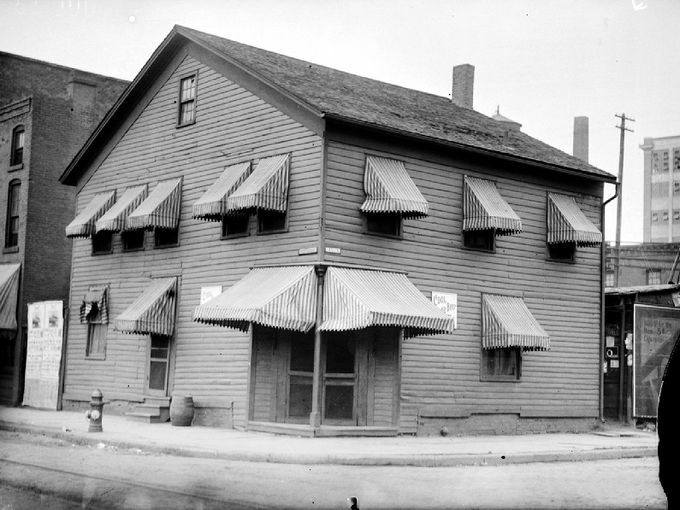 Detroit’s Griswold Bar, ca 1900-1920. Library of Congress Archives. Ever wonder why sometimes the stool at a historic bar, a really old one, doesn’t quite seem to match up to the height of the bar? This is one reason (also because drunks are really hard on chairs, stools and anything that’s not made of concrete). 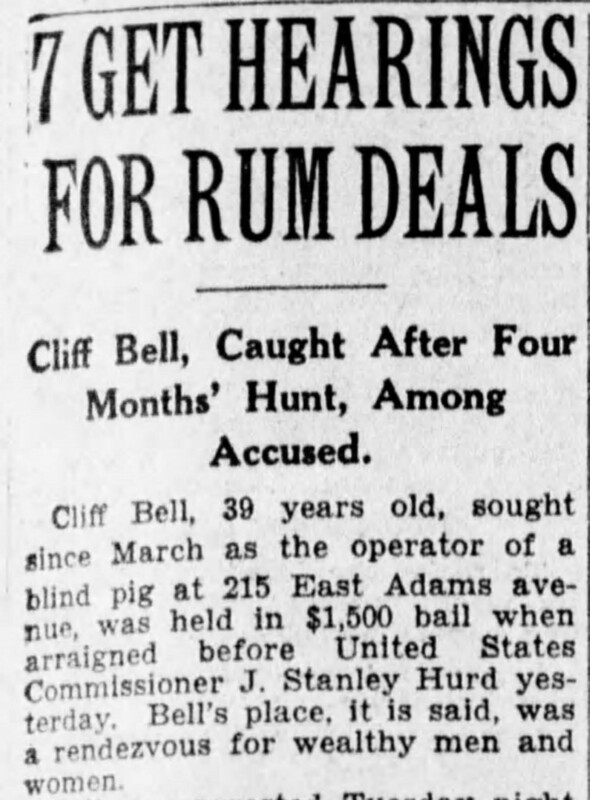 Okay, so granting the fact that he probably wasn’t the first to do it in the world, or maybe even in the States, Cliff Bell did all of us a favor. He was a keen entrepreneur, and he catered to “clubmen and many of the city’s literary elites” by importing the choicest liquor from Quebec and booking the hottest jazz bands for his wealthy clientele. When his Erskine Bridge Club was raided in 1928, he avoided capture for four months but was captured at another high-class speak in July. Cliff knew his audience, and he had the finest in innovations: air conditioning and the latest in refrigeration techniques at his post-Prohibition joints, the Commodore Club and the eponymous and dazzling Cliff Bell’s on Park Avenue, opened in 1935. Another such innovation was the barstool. So which came first, the ladies or the stools? 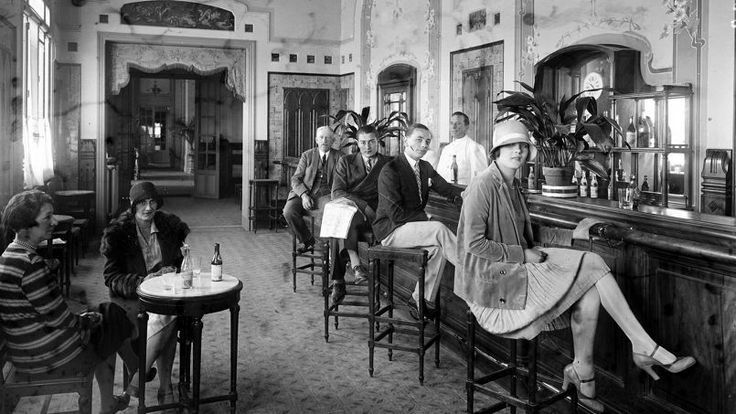 Hard to tell and even harder to prove, but we can bet that a savvy businessman like Cliff would have recognized that the valuable real estate in front of the bars could be put to work if the flappers who frequented his bars could perch there in addition to being seated at the swanky booths lining the walls. And the eye candy probably didn’t hurt his ability to draw male patrons either. It’s quite a dazzling picture, when you think about it. Take another look at those photos from Monaco and Rome. In one, we have three couples engrossed in their own conversations. They’re close enough to each other and the bartender to interact if they want to, and it’s sure convenient and comfortable, especially in those shoes. But that second photo…there’s a woman. Sitting at a bar. Alone. Think of the possibilities! A woman could drink with her friends or unaccompanied. She could engage in conversation with her fellow barflies. Or not. She could flirt, tease, pay for her own drink, even pick up a dashing fellow. Or not. And Cliff Bell? Well, he gave us the barstool. And I, for one, will be drinking a toast to Cliff next time I’m cozied up on one. 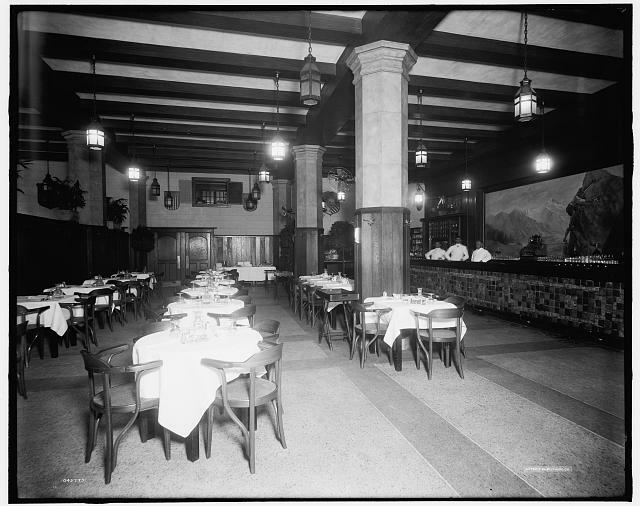 Adams Restaurant, Detroit in 1933. Detroit News Archives.